The term "donut" is extremely broad and is used to describe a wide variety of tasty treats. While most people agree a classic donut (spelled "doughnut" by some) is a sweet circle of fried dough, they actually vary widely in consistency, shape and flavor. Ranging from light and fluffy circles to dense and cakey options, donuts are usually fried but can also be baked. Raised Donuts: The raised donut has yeast in its dough, allowing it to rise to a light and airy consistency. They are often ring shaped, but this style is also commonly used for filled donuts since the texture allows room for insertion of jelly, custard or cream. Cake Donuts: Cake donuts use a batter similar to that of cake and generally use baking powder for their limited rise. Denser than their raised counterparts, cake donuts are less delicate and more substantial. These are quick and easy to make at home. While traditionally fried, some cake donut recipes have been modified to allow baking for a lower-fat version. 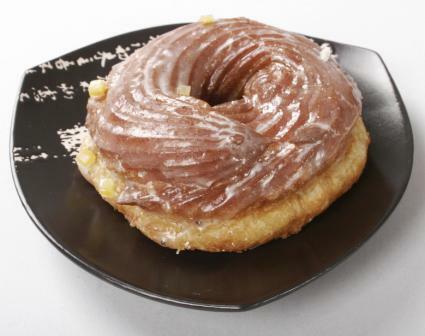 Crullers: The name cruller is actually used to describe two different styles of donuts. One is also called the "French Cruller," which is a fluted circular donut, with a puff pastry-like texture - lightly crispy on the outside and slightly eggy and moist on the inside. The word cruller is also used for a donut sometimes called the "old fashioned donut" - a cakelike fried ring donut that sometimes uses buttermilk in the recipe. Crullers are usually topped with a simple clear sugar glaze, and are a little lighter than cake donuts. While the most classic is flavored simply with vanilla, cinnamon or nutmeg, donuts can be made in a multitude of flavors. Some get their flavor from frosting or glaze on the outside of a plain vanilla treat, others impart different tastes via their fillings, while still others have flavorful additions to their dough or batter such as nuts, spices or fruit. Of course, chocolate donuts are beloved, but there are now recipes for more exotic inclusions like pumpkin, honey or even bacon. As with many of America's most beloved treats, donut recipes are believed to have originated in Europe; they came to America via European immigrants in the 1800s. Originally, the Dutch delight made by frying leftover bits of bread dough in hot oil was called the "olykoek." The origin of the current name is more difficult to determine, though. Some people think the Dutch twisted their dough into knots before they fried it and these turned into "dough knots," close to the term people know and love today. Others aren't so sure, and think it had to do with pressing nuts into the center of the rounds, hence "dough nuts." Wherever the name originates, there's no controversy around the popularity of these sweet treats. The good news is that they really aren't that difficult to whip up in the home kitchen!